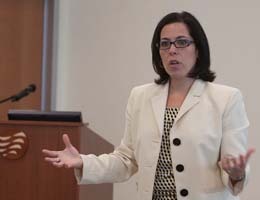 This year’s Women’s Leadership Speaker Series is a call to “Advance,” and Elizabeth Veliz, owner of Adelante HR Consulting, gave a call to action for students. “While you may face obstacles, do whatever it takes to keep moving forward. Never take the easy way out, and when someone helps you, pay it forward,” she said. Growing up in the projects in Union City, N.J., Veliz was no stranger to violence, drugs and life on the streets. “My parents came to America from Cuba with nothing, so we ended up living in pretty poor conditions. My father got work in a Cuban grocery store, but money was very tight. I learned early on that if I wanted to succeed, I’d have to make the right choices,” Veliz said. During her teenage years, Veliz steered clear of drugs, and while many of her friends became pregnant again and again, she graduated seventh in her high school class and was headed to Rutgers University. Veliz’s parents were unhappy with her choice, preferring she stay home and start a family. Determined to move forward, Veliz worked with her high school principal and landed a full scholarship. “Once I got to college, I’d like to say that everything was smooth sailing, but it wasn’t. I was distracted by all that college has to offer, and my grades fell. I lost my scholarship and ended up back home in the projects,” she said. Veliz went to work for Port Imperial Marina as a receptionist. She was promoted to office manager within 18 months. She helped move her family out of the projects. Life was looking up until she fell in love and married a man who separated her from family and friends. “It was a terrible time, and it almost cost me everything. But something inside of me surfaced, and with blood, sweat and tears, I changed my situation,” she said. Veliz continued working and returned to Rutgers. “I made a promise to myself, that I would get my degree. And this time I had to earn the money to pay for college,” she said. Veliz remained focused on her goal and with perseverance earned a bachelor of science in business administration and later a master of business administration in human resource management from University of Phoenix. While going to school, she climbed the ranks in corporate America, starting with the Xerox Corporation. Before opening her own business, she served as director of retention and recognition in human resources for University Health Systems of Eastern Carolina, now Vidant Health. Veliz reminds students that it’s not about the car you drive or the house you own, but the quality of your life and work that brings happiness. “I’m married to a U.S. Marine and we live in a 1,000 square-foot apartment and I drive a less than exciting vehicle, but I have an amazing life,” she said.